If you run a website then you need to be aware of backlinks to your own website and competitors. Backlinks are links to your website from other websites and sometimes called “inbound links” or “incoming links”. Backlinks can affect your website positively and negatively, boosting it on search engines but also running the risk of getting your website delisted and removed from search results. The backlink profile of your website is one of about 200 so-called ranking signals that are used by search engines (see our earlier post Ranking factors research). The search engines Google and Bing use backlinks to help rank websites in search engine results pages. The more high quality backlinks you have, the higher your website will rank in search engines. The quality and authority of the website. The quantity of these links. The text used in the link – the anchor text such as Exact-match, Partial-match, Branded, Naked URL link, Generic (such as Click Here) and Images (see Moz on anchor text for more information). If you have links are from good quality sites that appear natural then your website should be boosted in search results. As SEO professional we are trying to gain links naturally. This is where a real person has actively decided to add a link to your website on their web pages. It could be a blog post, news article or other type of page. This is so-called white hat SEO. So called black hat SEO techniques involve creating websites with links that are controlled and added by you or your SEO agents. These are so called Private Blog Networks. These can either generate high levels of website traffic or run the risk of getting your website banned by Google and removed from search results if they detect spam links. 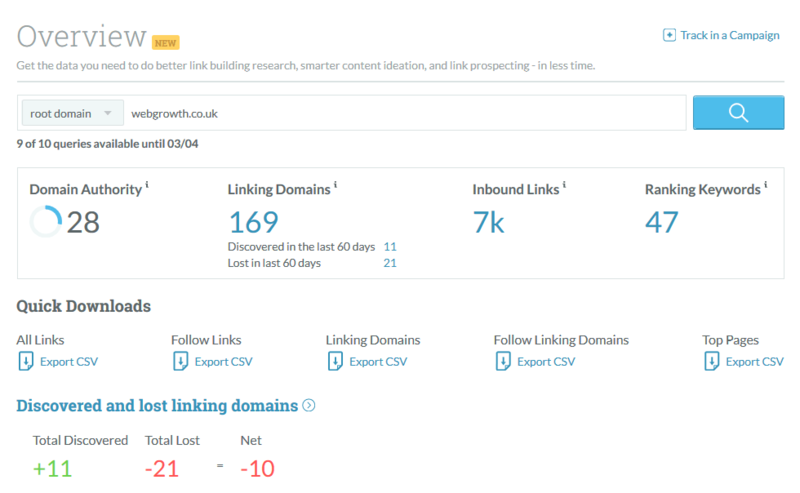 Whether you acquired links naturally or unnaturally or you simply want to spy on your competitors it’s useful to be able to view backlinks and assess their quality. This will help you plan your tactics and strategy in acquiring more and better quality backlinks. Here are some of our favourite tools for checking backlinks and generating a list. Google’s own Google Search Console is free and a vital tool for analysing your website’s performance and presence on search. It also has a Backlink checker tool that gives you a filterable list of all the websites and pages that links back to your website. There is no attempt at defining quality such as the now defunct Page Rank score but spot checks and suspiciously large amounts from an unfamiliar website might start ringing alarm bells. Where you have a link from an excessively poor quality (bad spelling, bad design, irrelevant or unclear purpose or subject matter) you should either ask for the link to be removed or add it to your disavow file. This is a file you can upload to GSC that tells Google to disregard a particular URL or whole domain in assessing where to rank a website in search results. GSC is only usable on your own website as to gather data you have to prove ownership of a website through a verification process. It is therefore not suitable for checking the backlinks and authority of competitors. That can be done through a selection of free and premium tools. Simply enter any URL and it will come back with a full listing of backlinks pointing at that URL. 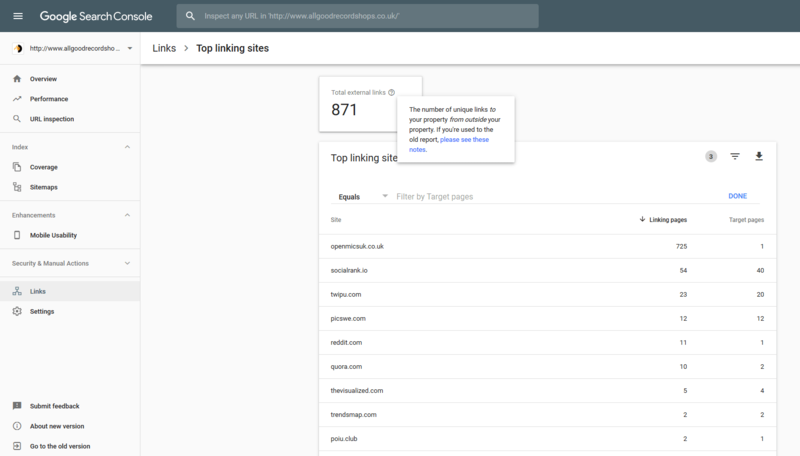 As well as the Backlink, Moz Open Site Explorer gives additional metric scores such as Domain authority, Page authority and Spam score. While not officially recognised, this Moz data is a fairly good indication of whether a backlink gives your website a boost on SERPS (Search Engine Ranking Pages) or may negatively affect your position because Google thinks you are trying to game the algorithm with spammy, low quality links. Page Authority – (PA) is a score developed by Moz that predicts how well a specific page will rank on search engine result pages (SERP). Page Authority scores range from one to 100, with higher scores corresponding to a greater ability to rank. Domain Authority – Predicts a root domain’s ranking potential relative to the domains in our index. Use this score to compare your likelihood to rank above that of your competitors. Spam Score – Spam Score represents the percentage of sites with similar features found by Moz to be penalized or banned by Google. Spam Score is based on their machine learning model which identified 27 common features among the millions of banned or penalized sites in the data. The free Moz Site Explorer provides up 10 free searches per month. OpenLinkProfiler is an easy to follow and free backlink checker. The quality of the backlinks that come up in your search results carries an ‘LIS’ (Link Influence Score) ranking that calculates the power of the links you find by a range of factors in order to tell you its true value to your site. Linkody are backlink specialists. Their backlink checker is free for checking up to 2 domains per week for free and is limited to 100 referring domains. These all have free trials but need a monthly subscription to use the full services. Monitor Backlinks – ‘The easiest way to check your bad links and your competitor’s good links,’ boast Monitor Backlinks. It has a flexible pricing structure with prices starting at $25 per month. Get in touch with Dinesh on 07941 686113 if you need help on web design, web hosting, SEO services, domain names or email marketing. Also see our earlier article on Link building for advice on what to do with this link information.